The American Painted Lady (Vanessa virginiensis) is a true brush-foot butterfly. They are found year-round throughout Florida in open fields and gardens. They feed on mud and the nectar on many plants. Adult butterflies have 1.75-2" wingspans. The cobweb pattern and large blue eyespots on the undersides of the wings are unique identifiers. 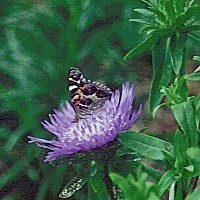 Hostplants include asters, mallows, and yellow thistle. The pale yellowish green eggs are laid individually on the upperside of leaves. The caterpillars are black with bands of yellow and black lines. In between the bands are orange or red spots at the base of black branching spines. They create silk nests with leaves. The chrysalis is brown with gold spots and is often formed in the nest. More photos of the American Painted Lady are in the Photo Gallery.